Have you ever found yourself craving for a vacation to a tropical island every time you come home from a long day of work? Do you know that feeling when you just want to take a break from it all, breathe and relax with nothing to worry about? I used to have that feeling every single time I came home from work after braving the long traffic ride. I overcome that feeling a long time ago and it feels really good to have a stress-free environment and state of mind. Do you want to know how I did it? Well, aside from taking that well-deserved vacation for a week, I did something in my home that took all my stress away one bath at a time. That’s right! I take the less expensive way of de-stressing every day. I chose to redecorate my bathroom in the most relaxing way possible. In decorating my bathroom, I turn to something practical, easy to do and closest to my heart. I am sure you would love to do it too. 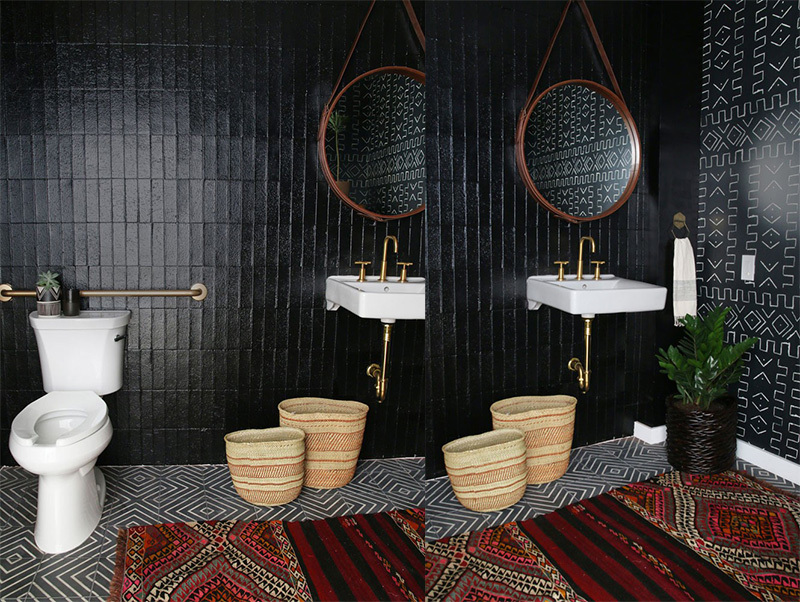 I have chosen the Bohemian look for my bathroom. I went for the Modern Bohemian style because I love how the fusion of Bohemian and Modern interior styles go together. It has the lovely and playful punches of the eclectic Bohemian aesthetic and the fresh, minimalist touch of Modern and Scandinavian design which you would be able to see in most of the designs on my list. 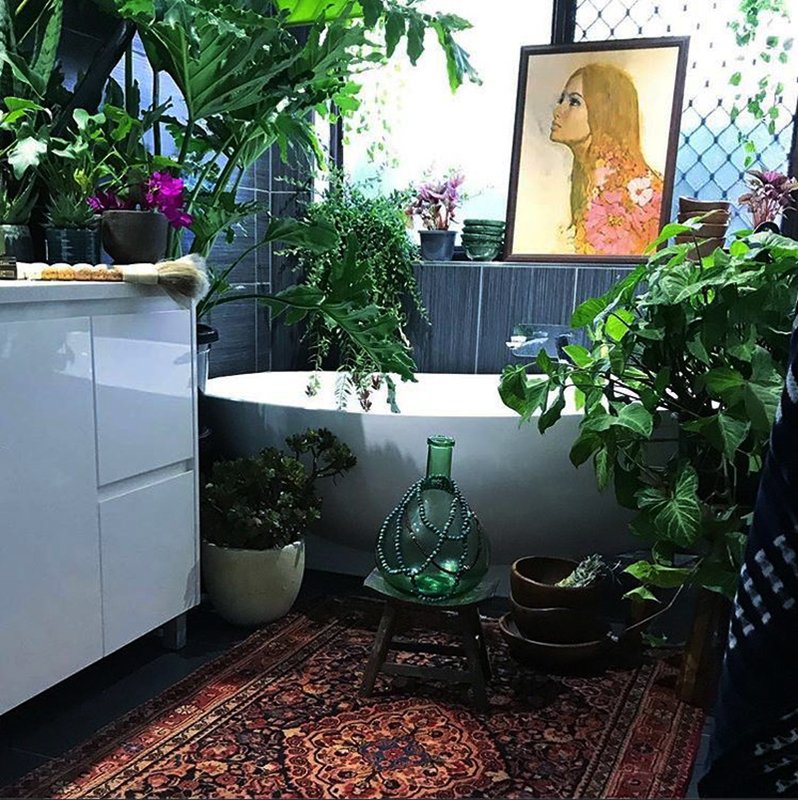 Keep reading to see and find your inspiration from these 20 Stylish and Relaxing Bohemian Bathroom Designs that will surely leave you in awe. Bohemian style often uses well-worn pieces from different periods and areas of the world, could be vintage or antique finds that tell a story and gives an eclectic look. 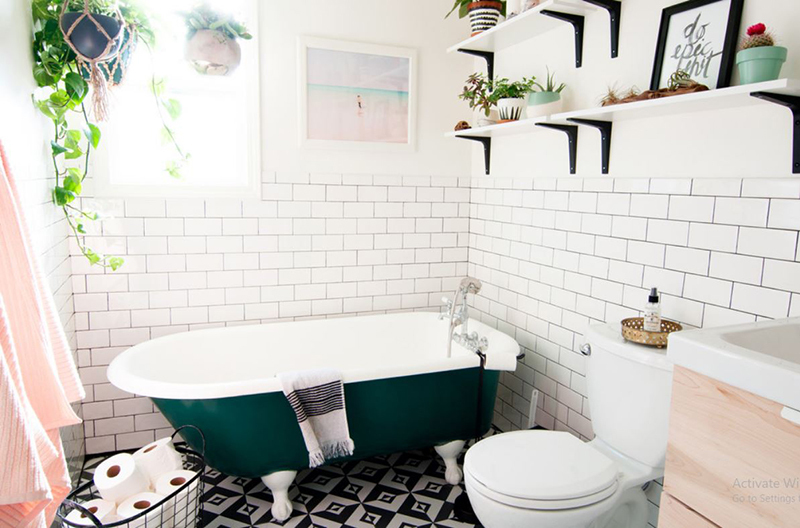 In this bathroom design, the old-fashioned bathtub that has a beautiful antique look takes the center stage as the green plants accentuated it with its fresh and calming look. 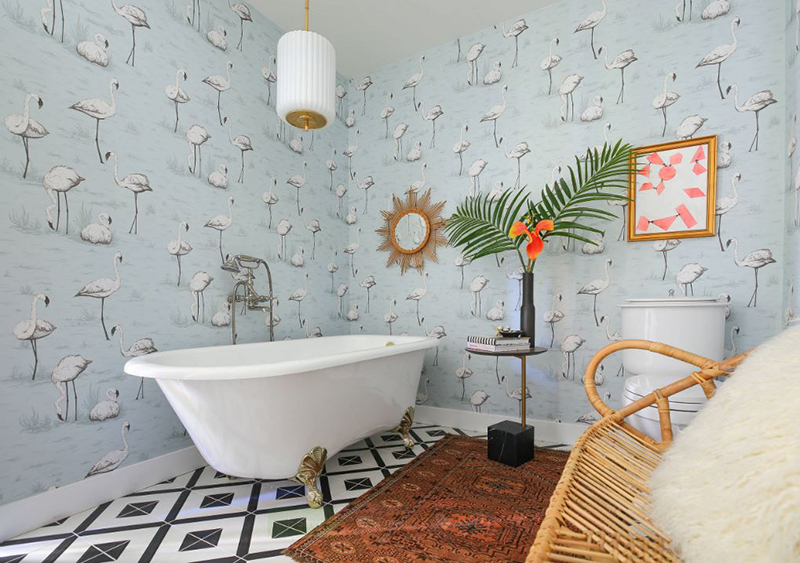 I am in love with the bold colors, playful patterns, and textures in this Bohemian bathroom design! It has rich-colored rugs with intricate details covering the equally exciting floor tiles. A deep black paint over the tile walls complements the bold tribal-pattern wallpaper of her own design giving the space so much character. 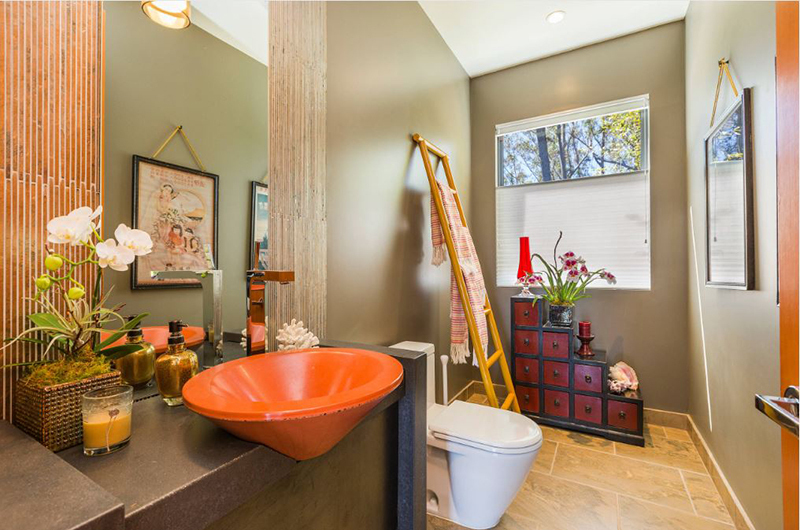 This is a “Modern Bohemian” bathroom style. It has the clean lines and minimalist look of modern style and the pops of Bohemian touch on area rugs and greenery. 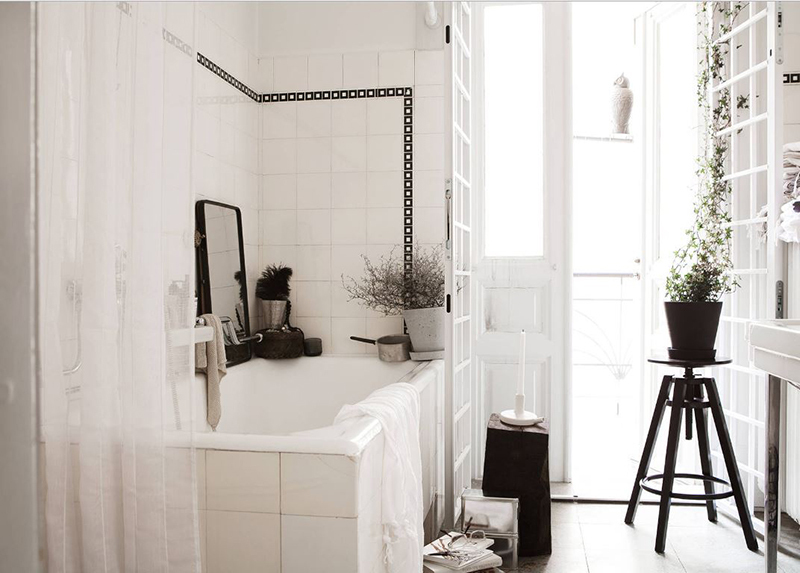 Look at how serene and laidback this bathroom is! The candles give a romantic feel. The wicker and wood decor make the space cozy and inviting and the green plants lift the warmth from it. I love the framed quote on the wall, it adds a fun vibe to the whole space. This is such an amazing bathroom! The mix of different patterns, rich colors and the plants in different heights, give interest and personality to the space. 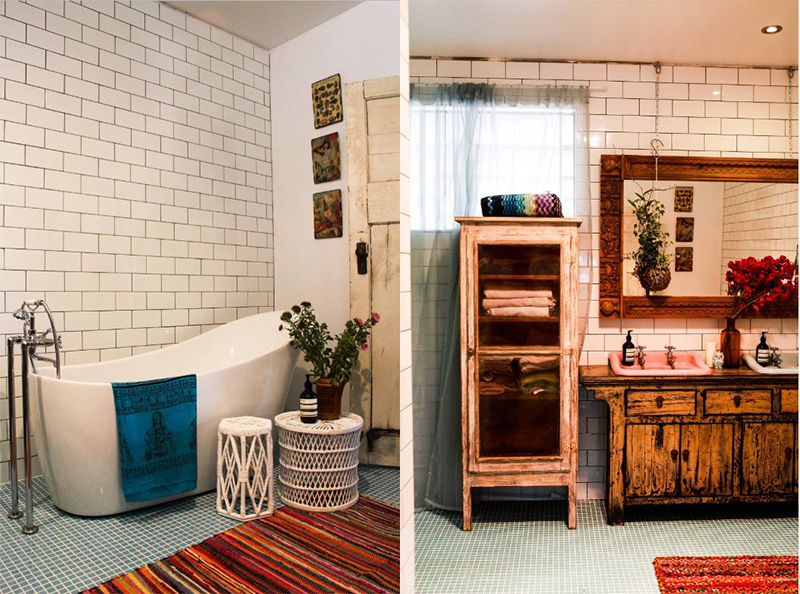 If you are the kind who loves bright colors, then this bohemian bathroom design is right for you! 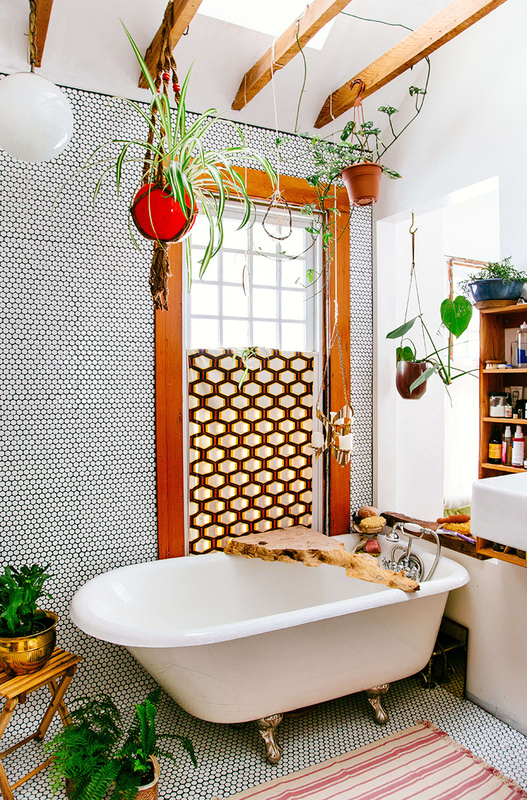 The bold colors complement the strikingly playful patterns and the black and white shower curtain balances the whole scheme. 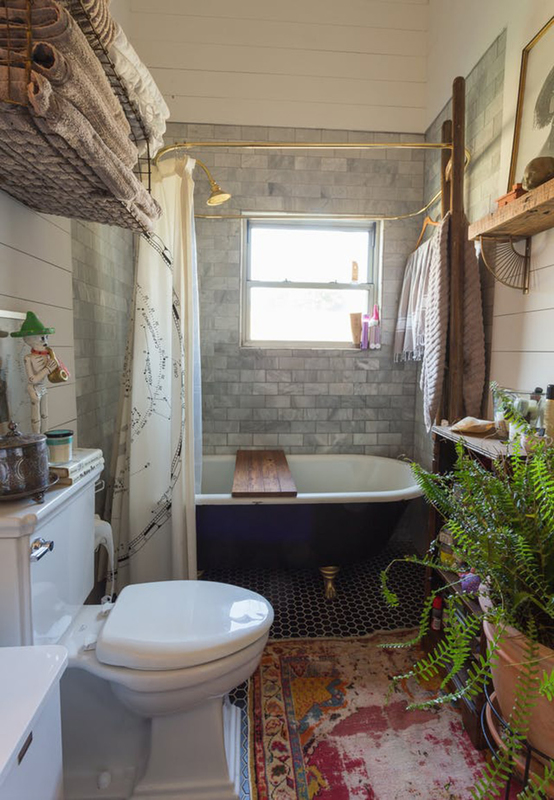 This gorgeous bathroom is intended for an urban bohemian girl in her 20’s. This design could also be for you, whatever your age is as long as you feel relaxed in a white-blue-brown-wood scheme. The beautiful colors go well together that it creates a calming and inviting vibe. It has the right amount of patterns that are sophisticated and chic. If you are up for a by-the-beach look, you may want to consider putting up hanging plants to give you that look. The white brick wall serves as a beautiful backdrop for the pops of colors. The geometric tiles give a 70’s hippie vibe. This one is neat! You get the clean lines of the modern design and the pops of interesting bohemian patterns giving character and tropical feel to the space. 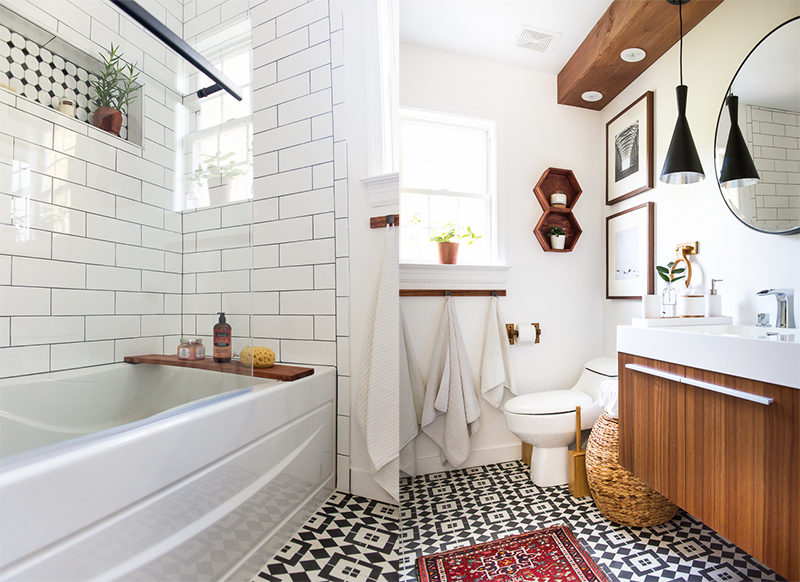 This bathroom space is a combination of vintage and modern aesthetics. It has the glamorous bohemian feel and the sophistication vibe of a modern minimalist. I love the flamingos on the wallpaper and its muted color making it a fun backdrop to all the pops of colors in the space. The bohemian interior is all about layers. Beautiful and exotic touches on layers like interesting patterns on the wall and woven rugs, lovely textures on wicker tables and bathroom furniture, artwork, plants, and flowers all of it give off a boho vibe that is full of life and so inviting. 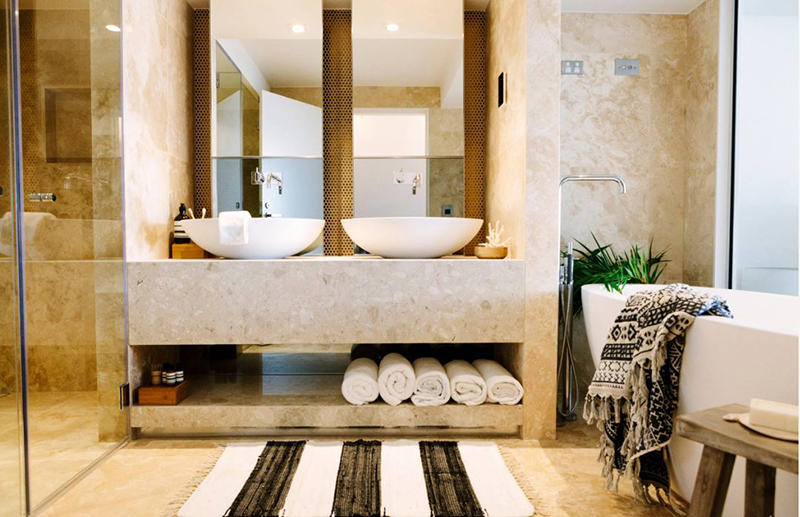 This beautiful bath space is filled with Moroccan influences and colorful accents with the clean, open and light-filled characteristics of modern design. 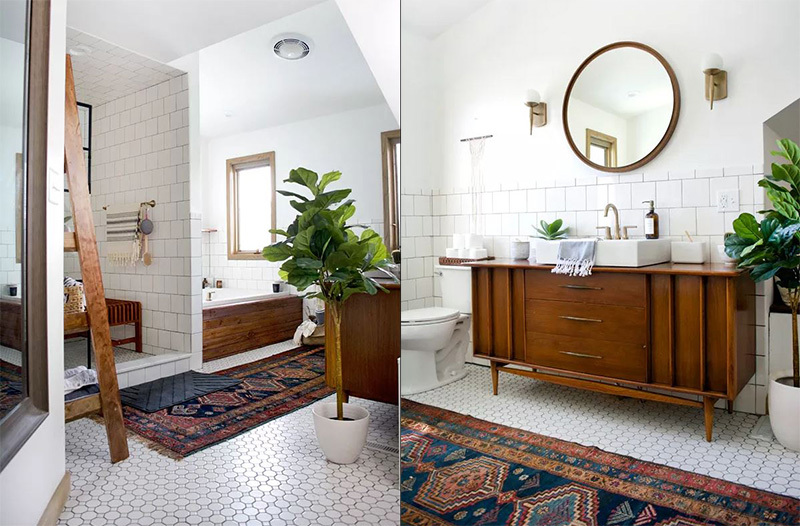 Choose a carpet with a global vibe to accentuate and add character to your bathroom like the one on this lovely bathroom design. 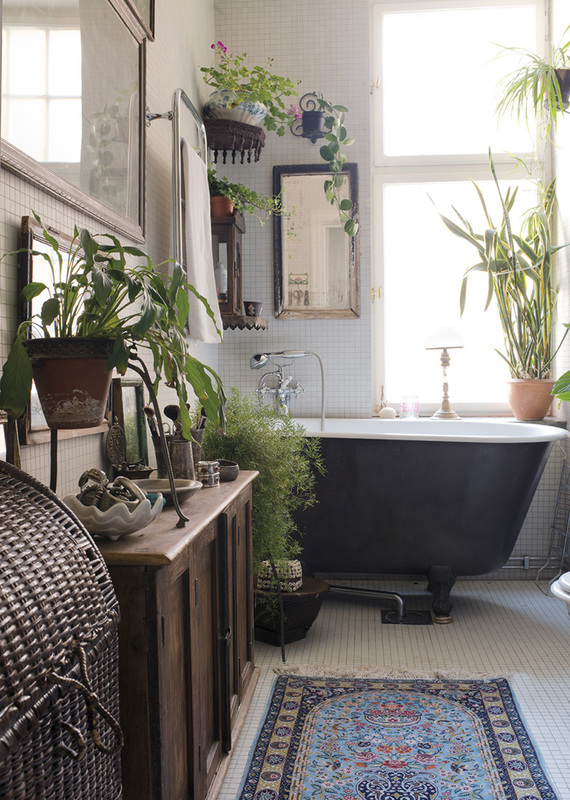 Fill the space with indoor plants in different sizes to make your bathroom more relaxing and inviting. 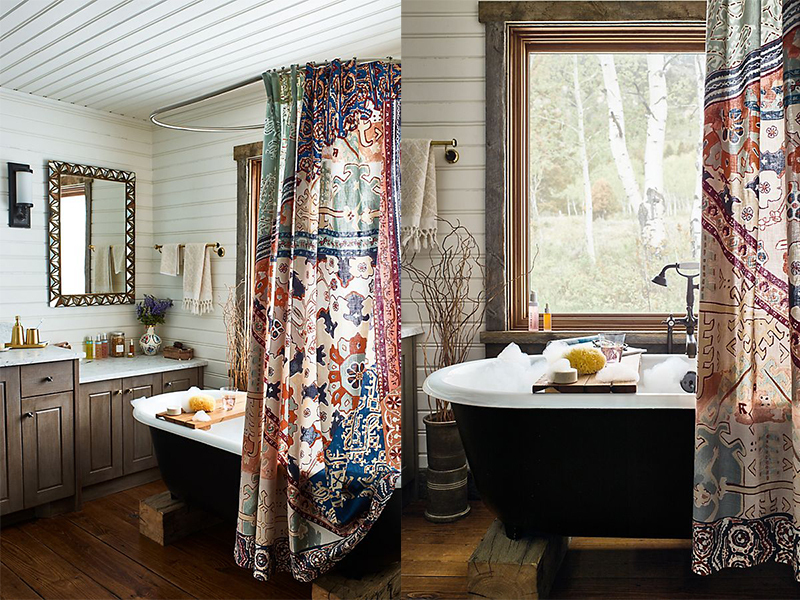 Invest on shower curtains with interesting and playful patterns that scream bohemian for an instant hippie vibe. It is a lot practical and cheaper than renovating the whole space. The best part is you can change it anytime you like. This bathroom space is nothing but peaceful and soothing. The pop of colors against the all-white backdrop gives character to the space. Make your bathroom stylish and dreamy by choosing whimsy decor like this potted plant that climbs the panel door on an adjustable stool creating a charming touch to this white space. 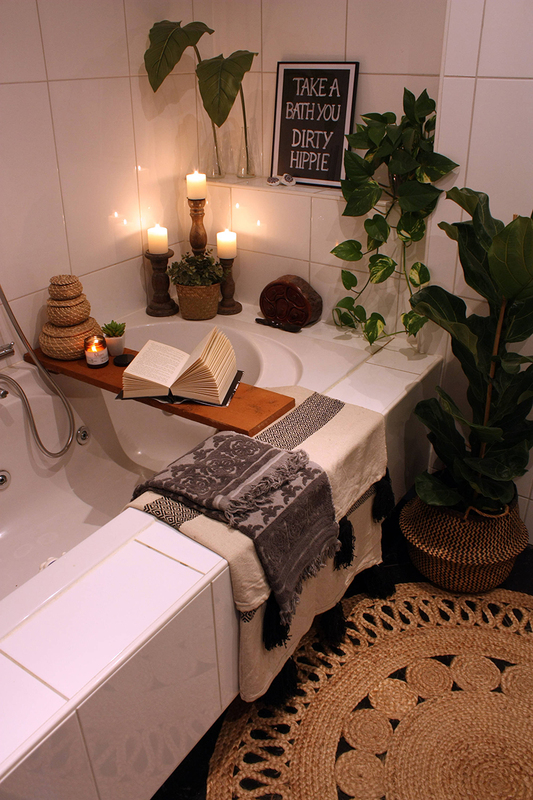 If you are more in touch on your artistic side, you may take inspiration from this amazing bohemian bathroom design. 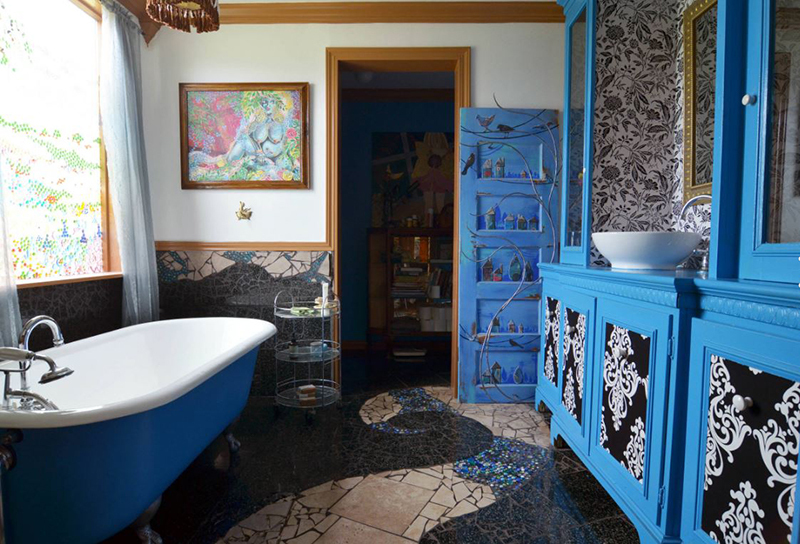 This black-and-blue bohemian bathroom is covered with swirling mosaic tile from walls to its floor creating an oceanic effect around the claw-foot tub. You can also repaint your old dresser or in this case old china hutch to serve as a vanity with plenty of storage. Make it fun and full of personality by adding different patterns, texture, and bold colors. 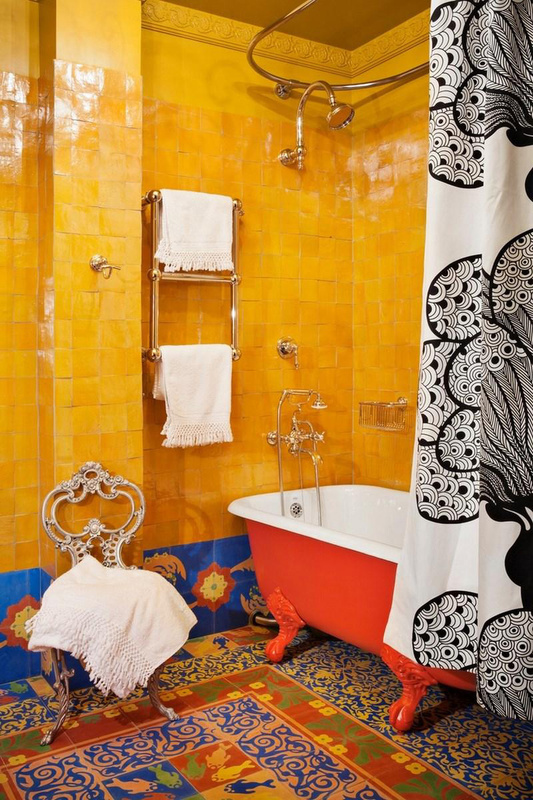 I love the fun punch of colors in this bathroom design and the unexpected choice of decor that give a global ambiance. This gorgeous bath is a mix of a mid-century and rustic style. It has a combination of modern and vintage furniture with decor from the owners’ travels giving a true bohemian atmosphere. If you are working on an all-neutral color scheme the best way to add color and fun to the space is to throw a decor that will give high contrast. 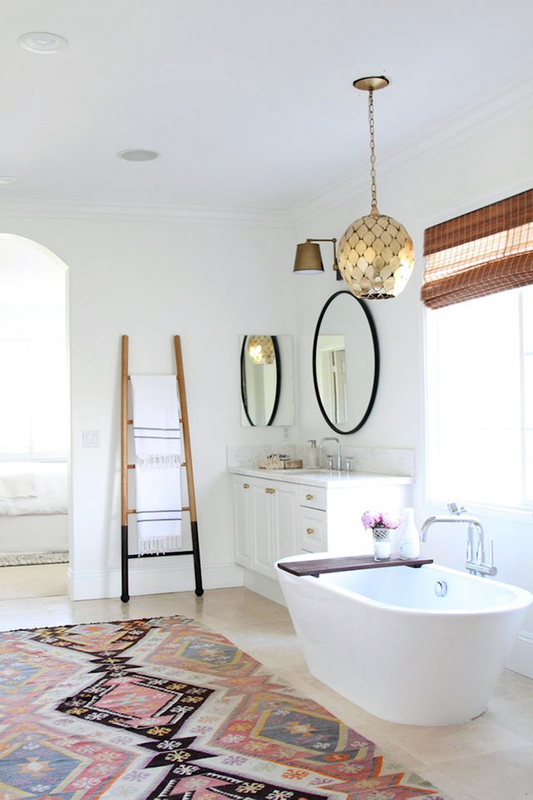 Take a look at how this beautiful vintage rug livens the already delightful space. 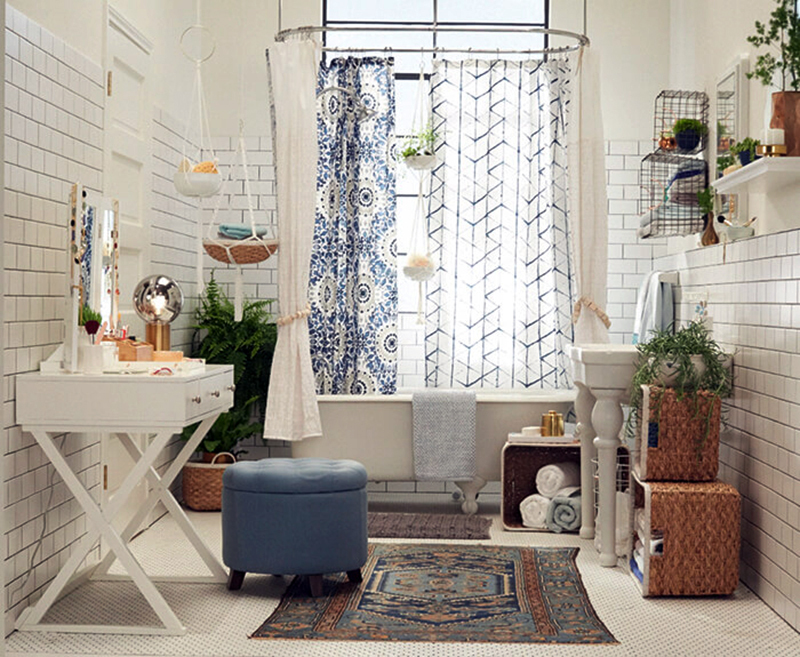 I am sure you will agree with me that those Bohemian bathrooms are gorgeous, stylish and dreamy. A space you can unwind, relax and get refreshed after your seemingly non-stop daily endeavor. You see Bohemian interiors are all about mixing and matching decor, styles, and furniture that do not usually go together yet turned out beautifully and stylish. 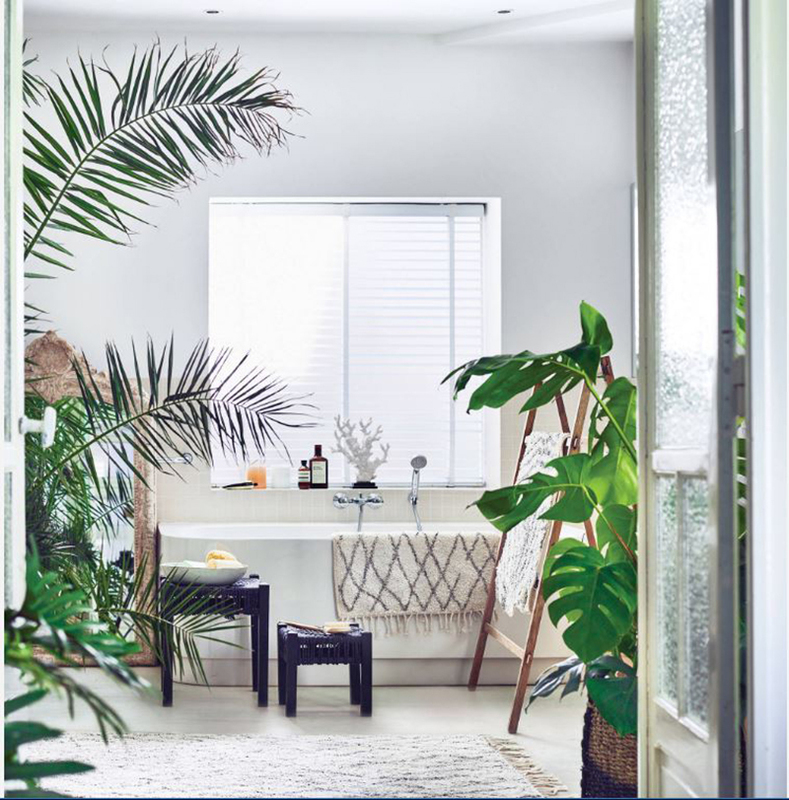 These bath spaces with a combination of its modern influence, its eclectic touches, and global atmosphere exude an exotic look that is inviting and calming at the same time. And isn’t that what you want too? So give it a go and who knows it might just be what you needed to keep the positive vibe going in your home and in you personally.